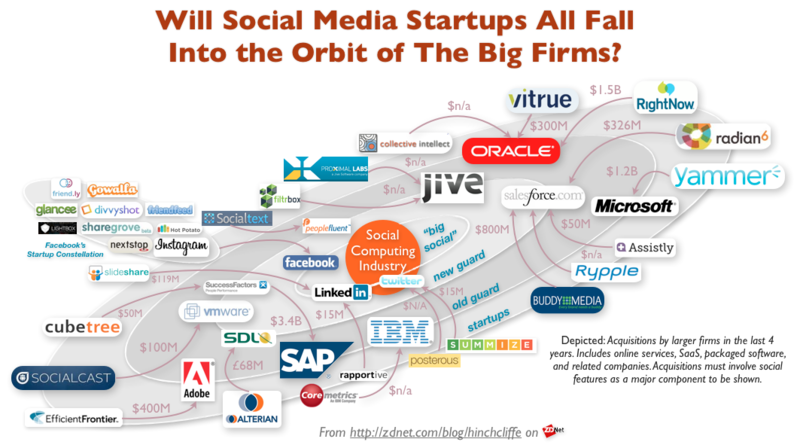 Will social software startups "collapse into the orbit" of the big vendors? With Microsoft finally making a major acquisition move in social software, are we now seeing the roll up of the entire social business industry? Or is this just an minor story in a vast parade of change when it comes to how enterprises are moving to social software? While investors want to get their returns, in the end, companies that put their customers first and foremost tend to do better than those that do not. Will the end game of social software result in most of the products under the wings of big firms? With this week's announcement -- be sure to read Larry Dignan's great analysis of this move -- that Microsoft is acquiring enterprise microblogging firm Yammer, the rollup of the industry has perhaps now reached a seminal phase. Or has it? While a few companies in both enterprise and consumer social media have stood out and created their own destiny, for instance Facebook most recently joined LinkedIn and Jive as stand-alone masters of the social universe as public companies, most companies in the industry with a decent value proposition are instead going the acquisition route. So, as the social media industry in all its forms matures, we might be seeing the broad outlines for the end game. Or, as it turns out, at least the ongoing game. Firms that offer successful collaboration software, social customer service, social marketing, and social media analytics are all currently in play or likely targets as they reach an interesting size. Yet, most don't have the kind of traction to achieve a dramatic IPO or even a major acquisition that would please their investors. In fact, I find that there are still too many social media companies and they haven't shaken out enough yet. Yet there is significant pressure for acquirers to make moves now. Fueling these particular flames are data such as iDC's latest prediction that social software and team collaboration will be two of the three big areas that lead growth in the software industry this year. Industry leaders just can't afford not to get invested where the market has traction. Thus, given the large IPOs that are possible for companies that can build the right offerings out the right pieces (see: Facebook) or have a desperate need to continue growing (i.e. the major software vendors such as Oracle, SAP, Microsoft, and IBM) the lack of a shakeout won't stop them. In fact, some would say it's smart to acquire companies early, when they first show promise, rather than wait until they prove their mettle and skyrocket in value, and therefore acquisition cost. A) Loss of focus on social. Many of the acquiring companies have a wide variety of product offerings, interests, and competencies. Acquisitions dilute the company being absorbed, often losing much of what make it special in the first place. The founders, often the driving force behind the startup, largely get cashed out and marginalized in the new organization. The result is blunting and erosion of the unique elements and underlying strengths of the acquired product, particularly with social software, which is very different than traditional enterprise software. B) A retrograde shift to the old enterprise world. Many of the acquiring companies in social are traditional enterprise software vendors that are decades old. While I've worked with IBM, Microsoft, SAP, and Oracle over the years, and like and respect them, they often just don't have the sensibilities of today's highly consumerized, social, mobile, and cloudy world. It's one of the reasons that the big vendors want their hands on the exciting new startups: It's a great way to get fresh blood, even though the proverbial "pickle" (the startup) tends to be brined (the giant enterprise vendor) far more than the brine gets pickled. This is unfortunate for businesses, because we're at several major tipping points for how software operates, is sold, is delivered, and provides value. "Big social", the giant public social networks like Facebook, Twitter, and LinkedIn. The new guard, or the newest generation of enterprise software vendors. The old guard, the long-standing firms in the space that have survived numerous generations of software innovation. The startups, these are the social startups themselves, though I've only listed the ones that have been involved in acquisitions. Facebook: Instagram, Gowalla, Glancee, divvyshot, Hot Potato, Friendfeed, Lightbox, ShareGrove, and more. Don’t fight it, and don’t regret it: large vendors do not innovate at the ‘edges’ where you are seeking to best engage the consumers who buy from you. Social media, digital marketing, ad placement, content personalization, presence-based services, collaboration and social network analysis, reputation management – all are outside of the capabilities of the ‘majors’ but not outside of their price range. They will re-platform, invest money, expand the scale. IBM, Oracle and Microsoft, and now Google, Apple and Facebook are (perhaps) the only majors with legs. The rest are likely to collapse into the orbit of the true planets. It is all ok. Eyes wide open and with a clear vision for where you are going – and you will be able to innovate most rapidly with the innovators. Unfortunately, while this may be true and enterprise customers should expect it, it's not always the best for them. Where are the customers in all this maneuvering? In fact, many of the enterprise customers I work with greatly value startups as a way to hedge their bets with entrenched vendors. They are often quite disappointed when they get rolled up, realizing that they will become just one of thousands of customers. Worse, what made the product they used a shining light in their industry is at risk of becoming just another cog in a vast set of increasingly anonymous enterprise offerings. What are companies to do then? With the increasing disposability of software in an app store supplied mobile IT landscape and frequent lack of leadership from IT when it comes to social media, organizations need to place well-hedged bets. The constant parade of vendors won't matter as much. Businesses therefore must assume that the software landscape is much more fluid than it has been even in the very recent past. New players will come and go more and more quickly, and companies must start focusing more on open standards for social software (both data and interoperability) and less on specific vendors, in order to retain flexibility and agility. In the meantime, social media is seeping in around the edges into the architectures of our organizations in a major way. Portfolio management and rationalization of social media solutions will soon become the next big challenge. At the same time, even though I tracked over 100 major social business solutions back in 2009, I'm now seeing as many new startups in the Enterprise 2.0 space as I did back then. Innovation and entrepreneurship in social business both are picking up, not slowing down. In my next post, I'll explore these new emerging points of light as we head into the Enterprise 2.0 Conference in Boston next week and lots more news in this space. I'll post as much here as I can, in the meantime you can also catch my workshop on next-generation enterprises there, or come to the book signing for our new management book, Social Business By Design, sponsored by MoxieSoft.